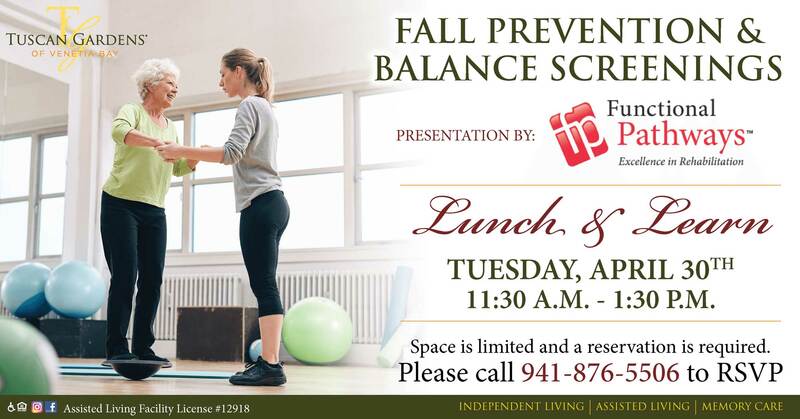 Fall prevention lunch and learn with free balance screenings. Falls are not an inevitable consequence of aging. Make strides towards lowering your fall risk at this lunch and learn presented by experts from Functional Pathways in partnership with Tuscan Gardens® of Venetia Bay. The expert therapists from Functional Pathways will share ways to reduce the probability of falling and prevent serious injury if a fall does occur, helping individuals maintain independence and build strength in everyday life.